Eight years ago, her husband and children were killed in a plane crash. Now, new evidence reveals that they didn’t die—her husband deliberately vanished—and that he knows a secret the powerful forces will stop at nothing to keep hidden. Kathy Kelly’s world was shattered when a plane carrying her husband—an Iraq War veteran and devoted father—and her two children vanished from the sky one night. No trace of the plane was ever found. Eight years later, Kathy has struggled to rebuild her life, but then wreckage of his plane is found in the wilderness of Great Smoky Mountain National Park—hundreds of miles from where her husband’s plane should have been. The pilot perished in the crash, but there is no sign of Jack or the children. Could they have made it out alive after all? But if so, where have they been all this time? Where are they now? As Kathy searches for any clue about what happened to her family, the investigation uncovers some unsettling clues—including a briefcase containing millions of dollars in cash, a priceless mask stolen from an Iraqi museum, and a clue that links Jack’s disappearance with the suspicious death of Kathy’s mother years ago. But she soon learns that others have been looking for the wreckage and its occupants for a long time. Others who are determined to make sure she never finds her family and that they remain dead. Shadowy, powerful people who will kill for what was on board—a secret her husband was the keeper of. A secret so powerful it will open a Pandora’s box of bloody revenge—one that reaches back into the past and into the highest echelons of wealth and power, all the way to the White House. This breathless, pulse-pounding thriller examines the very real billions in cash and priceless artifacts that vanished into the pockets of powerful American men during the Iraq war, and examines the extreme lengths some people will go to protect the secrets of what really happened to all that money. 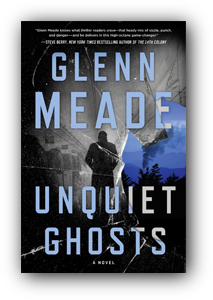 “Glenn Meade knows what thriller readers crave — that heady mix of sizzle, punch, and danger — and he delivers in a high-octane game-changer." "A physically and emotionally tense thriller...Such a compelling story that my eyes were riveted to the page..."
"You won't want to miss this beautiful book, so make sure you pre-order a copy! I give this book 5/5 stars"